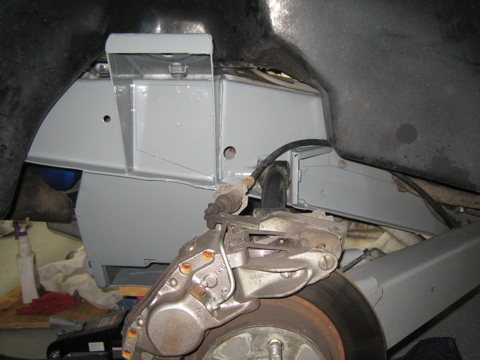 First, empty your luggage compartment, remove spare tire, remove access plate to fuel tank. 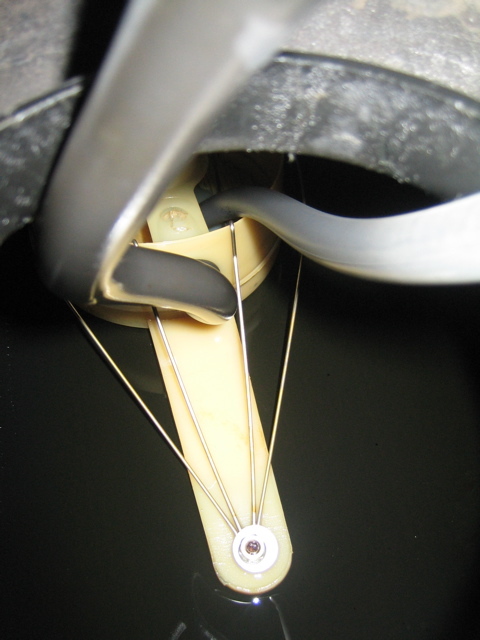 Remove clamp around boot. 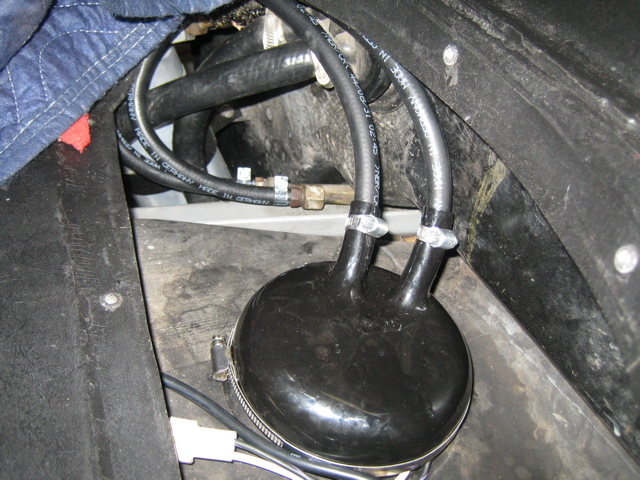 Remove top boot so you have access to the fuel lines off the return line and pump. 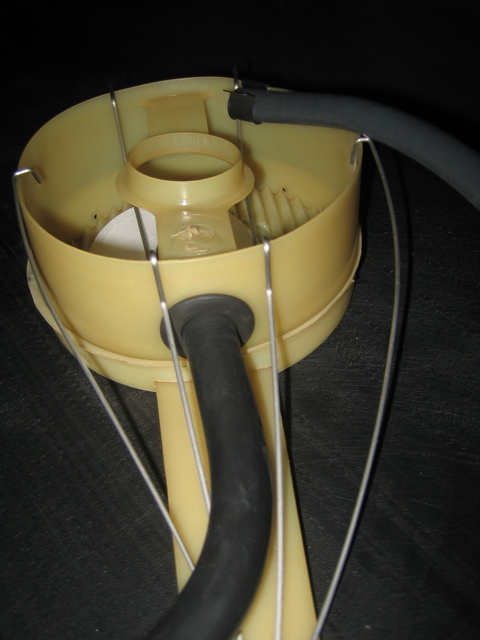 Remove return line and pump line. It is recommended that you label these if you are unfamiliar with their orientation. Wipe up dispensed gas and push aside. Take long screwdriver and duct tape siphon hose onto the end. Stick in tank in sender hole. 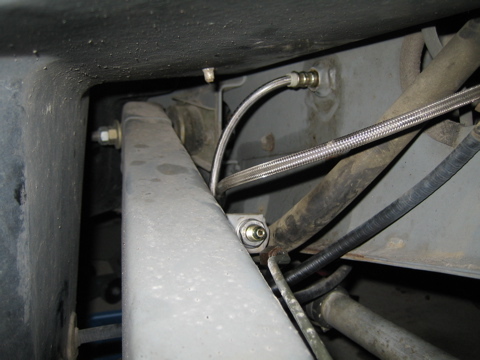 Depending on the length of your siphon hose you may need to route it behind the passenger wheel well and around the A/C accumulator. Pump gas out of tank until empty. If gas is clean you can store in a container for lawn mower, generator, etc. 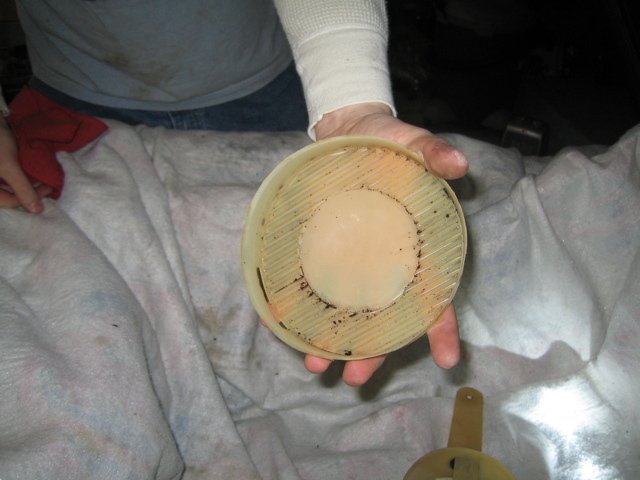 If gas is bad you should dispose of it properly. 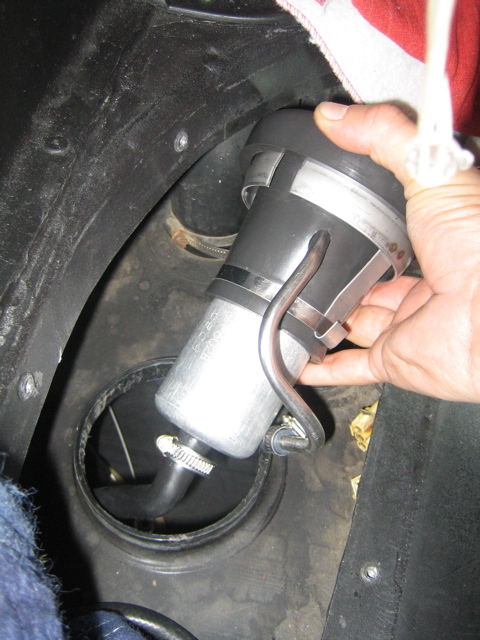 Now unplug fuel pump and lift boot out of tank. 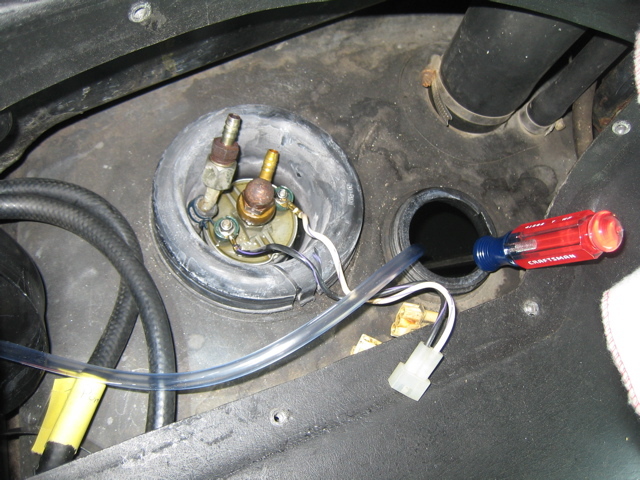 Remove the two hoses attached to pump and return line. 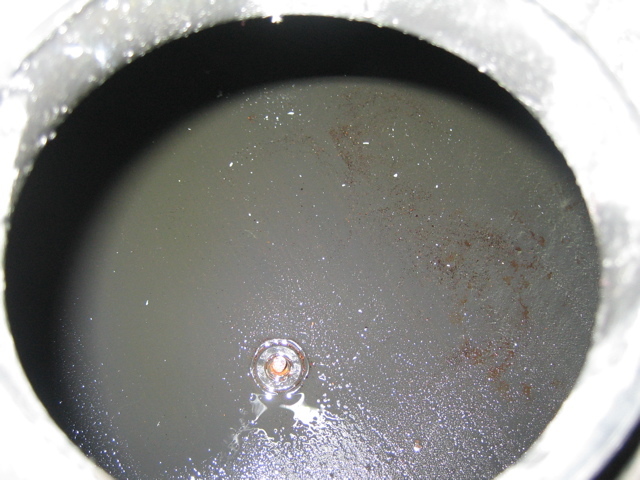 Check to see if there is any remaining fuel now that you have better tank access and remove if present. Reassemble in the same order you removed items. 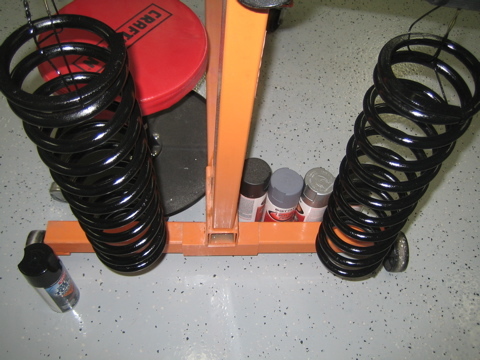 It is recommended while you are in there to replace all clamps/hoses/etc. When installing the new pump, the torque setting for the dome nut on the pump banjo bolt is 11 ft/lbs. It should be a 19mm nut. 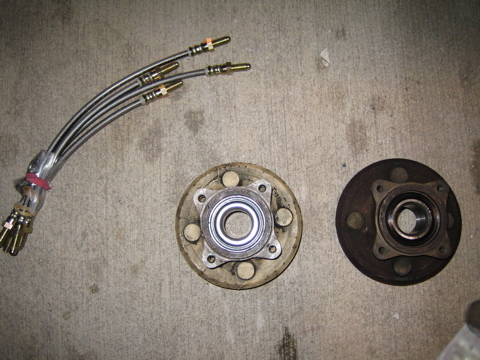 The positive connection nut on the pump is 7mm and the negative is 8mm. When replacing the pump and boot, be sure not to kink the pickup line. 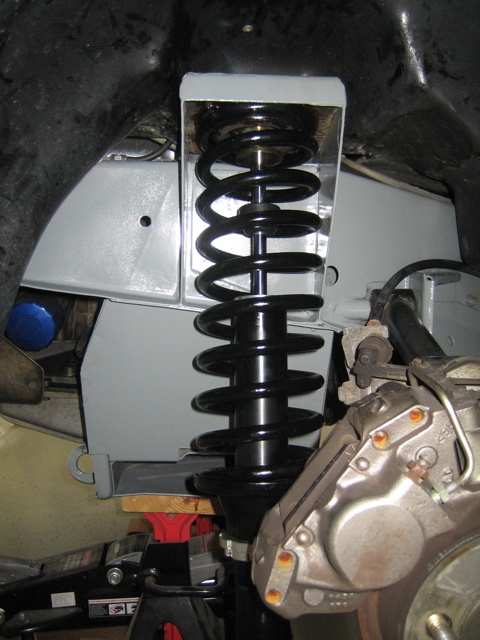 It is best to use the sender hole at this point to make sure you have everything installed and not kinked. 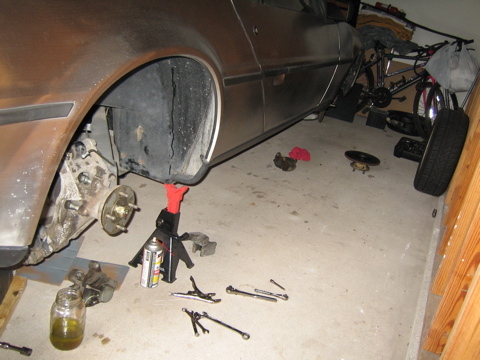 Finally, reconnect fuel line and return line, replace boot, clamps, and you are set. 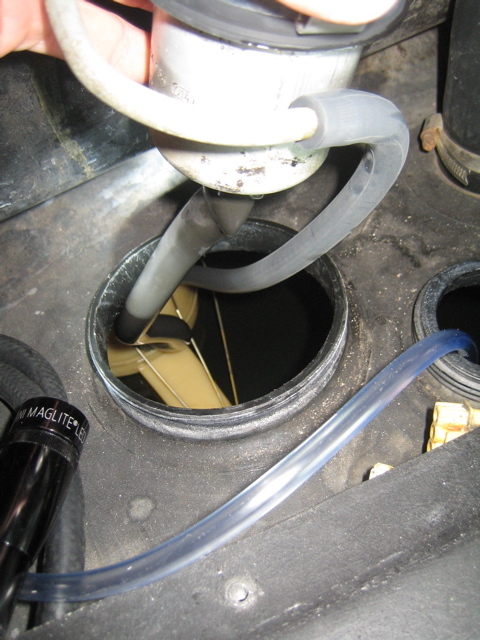 You should put a few gallons of fresh gas in the car now, then fill the tank up to max and check for any leaks. 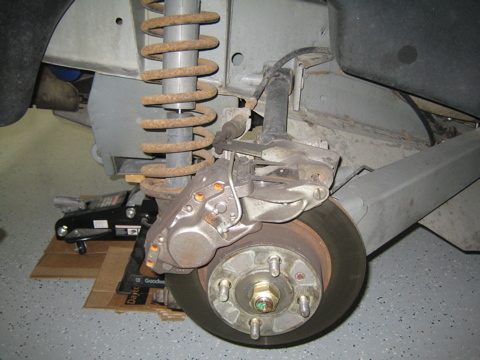 (1) Jack up car, remove driver wheel, prop some wood under passenger wheel, set car down with passenger wheel up on wood and the underside supported by a jackstand on the drivers side of the front frame. 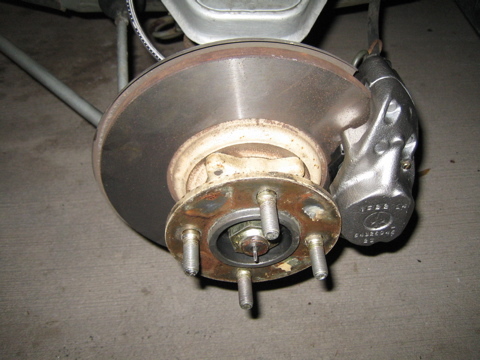 This helped keep some weight on the steering rack and make the wheel stay in one place for the most part. (2) Get on your back in the drivers footwell. Remove the seat if you want (I didn't). Remove the steering wheel surround. Remove the kneepads. 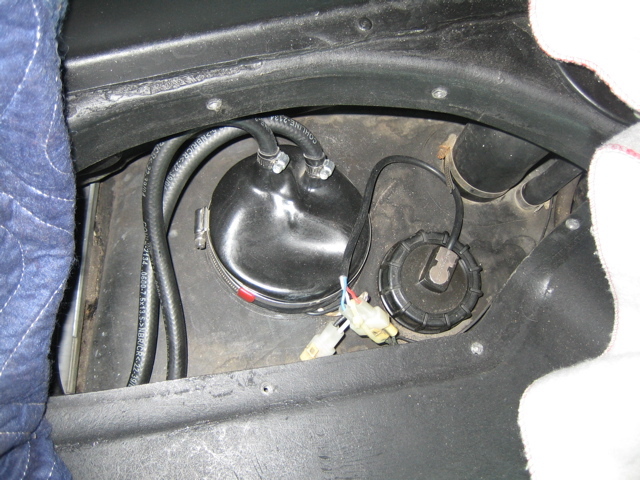 Unhook wiring from the steering column (3 plugs). You now have two brackets hanging down from where the kneepads were connected. 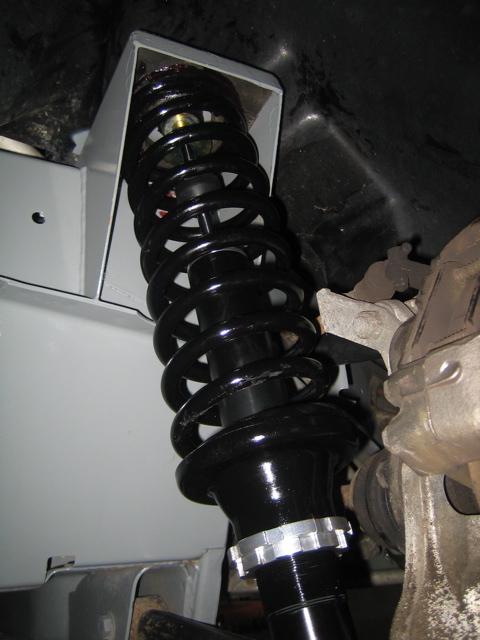 Bend these up and to the rear of the car. They bend back, but they need to be out of the way for reinstall anyway, so make it easier on yourself now. (3) Get back out of the car and crawl under the front/side. Look up and you'll see where the column comes through the firewall to the u-joint. 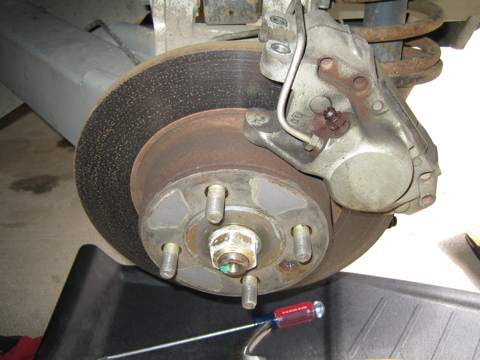 Remove the bolt that goes through the u-joint. 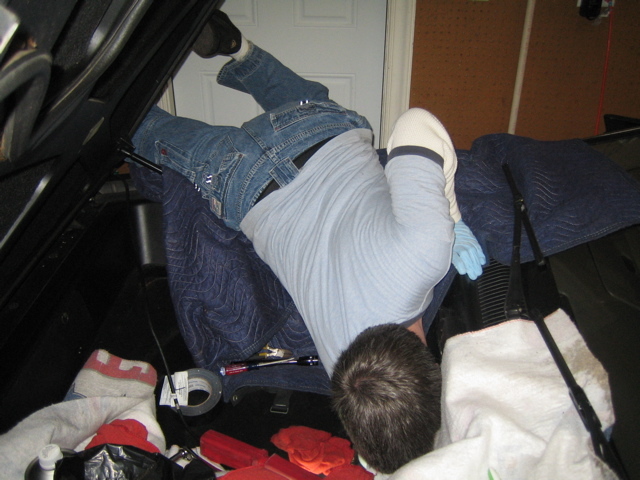 (4) Get back in the car, pull the seat forward a bit (if you removed the seat, your going to need help now). 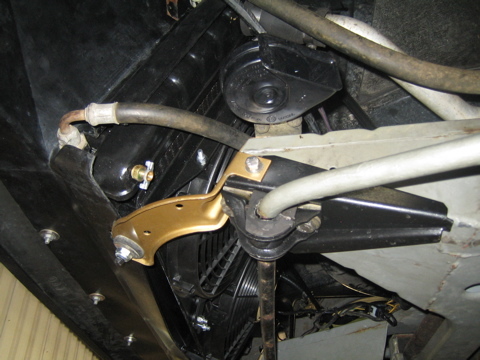 Remove the two bolts holding the column into the dash. Drop the column down onto the seat. Get out and start giving it a tug to begin pulling it out of the u-joint. 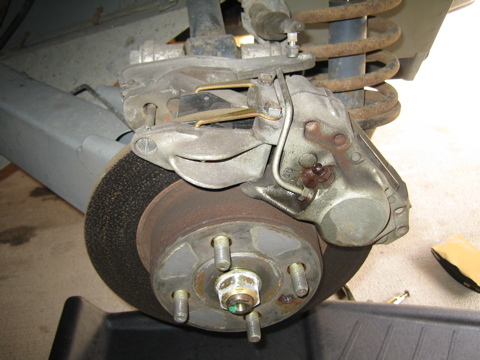 (5) Get back under the car, use the pen to mark where it is coming out of the u-joint. I marked where the splines were 'open' (not covered by the u-joint, where it compresses) so I could see them easier upon reinstall. (6) I had to go back and fourth at this point, pounding with my palm on the u-joint connection and then in the car giving small tugs. 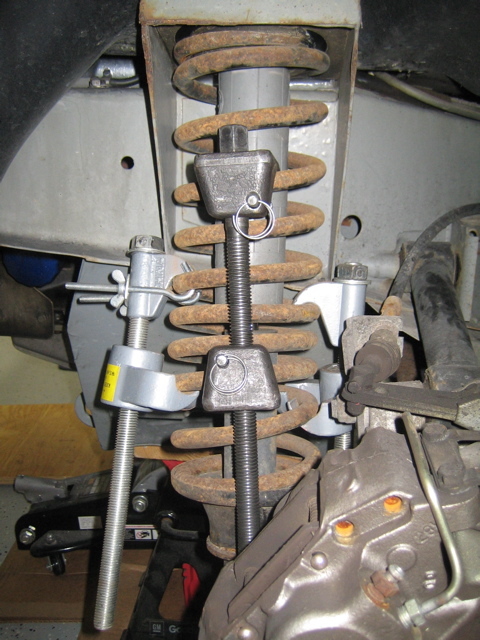 I found it easier to use vice grips on the inner column on the inside of the car to help finish pulling it off the u-joint. 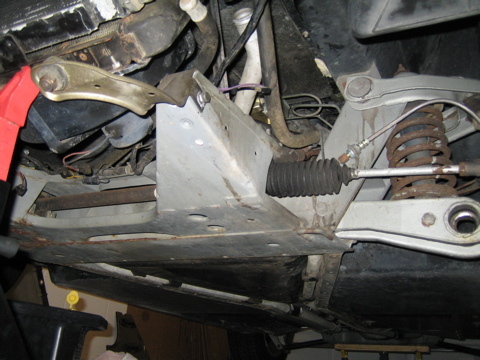 Once disconnected remove the column from the car. 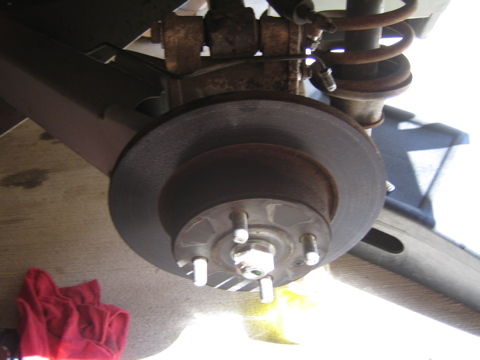 (7) Time to install the new bushing. 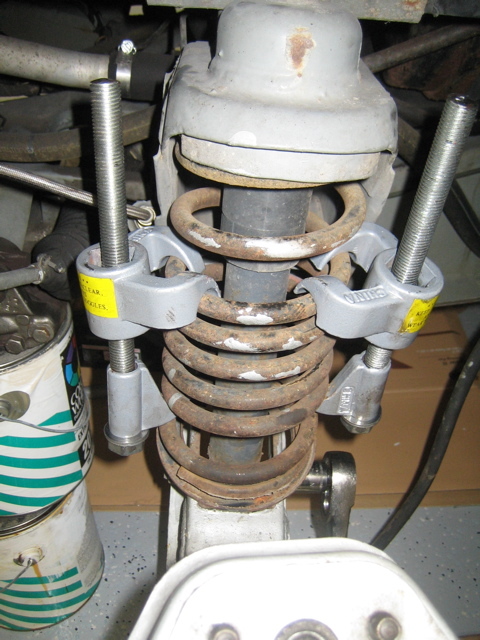 I have seen comments on the board that the new bushing needs to be 'pulled' into the firewall. I had no problems just pounding it in place. Pushed in with my fingers, grabbed a socket and an extension, placed the socket around the bushing (used a towel as padding) and pounded it in. Took some force but popped in without a problem. 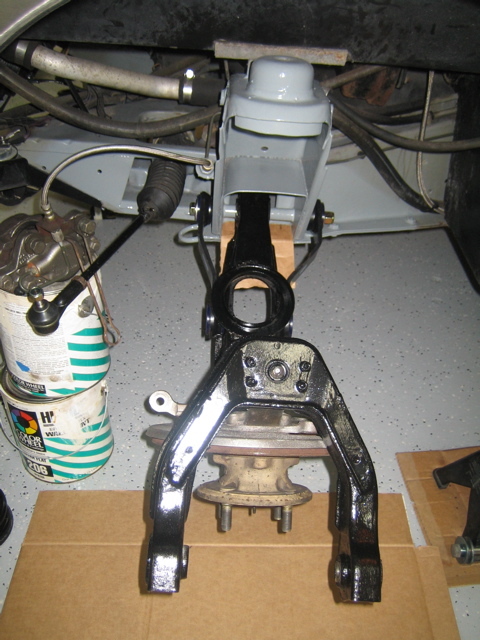 (8) Cleaned the unmarked splines off the steering column connection point and drew my marks darker. Now you'll need help. 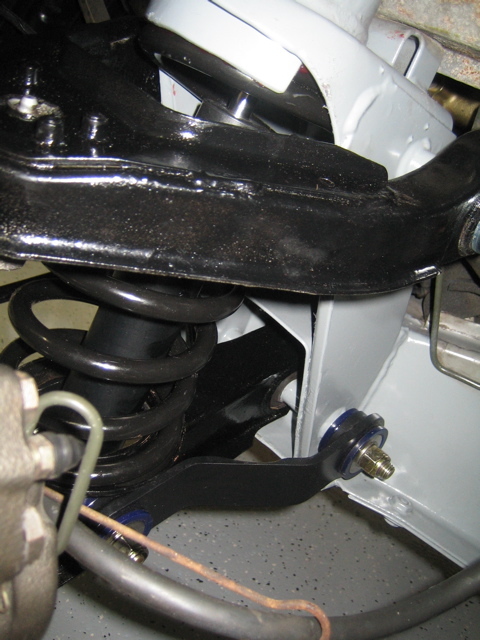 With vice grips around the inner column where it sticks out of the outer column, put the column back in the car and have a helper sit in the seat and lift the column up. Line it up and begin feeding it through the bushing. (9) Now start to use some force, the inner column will begin to be pushed by the outer column, but be careful not to collapse the outer column cage. I had the helper push on the wheel while I pushed on the vice grips. It fed through with some force. 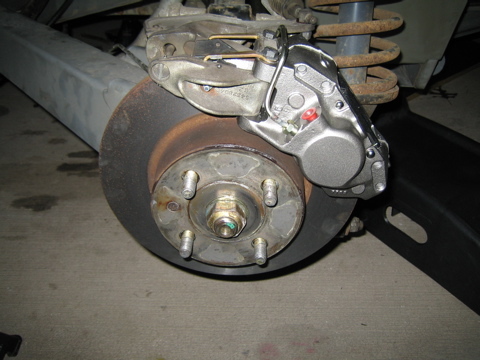 Go slowly at this point and hop back under the car to feed it correctly into the u-joint. If you push it all the way through you'll need to feed it back a bit in order to get it back in the u-joint. (10) Now that you have started to get it in the u-joint, just keep feeding it through and readjusting until it has reseated itself. It needs to go all the way in, as that 'curve' cutout in the splines is where the bolt holds it in place. 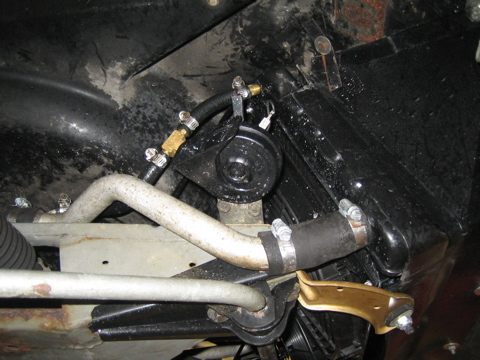 Slide the bolt in the u-joint before rebolting the column to the dash. 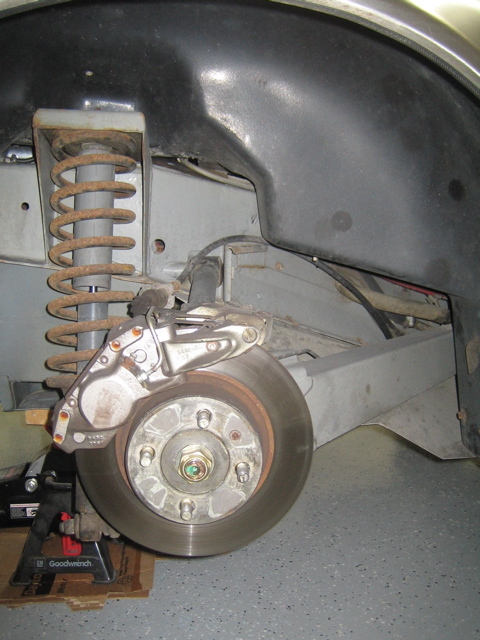 Give your helper some thanks and get back in the car to start the reassembly. Haven't really worked on the car at all over the last few months, however, we had a club tech day this weekend and I was able to get some pictures of the radiator fully reinstalled when the car was up on a lift. I had painted all the brackets that were rusty and deteriorating, touched up paint on the A/C condenser, and had to touch up some paint on the radiator that chipped while installing. Here are the pictures of it back in place. Finished a lot this weekend getting the radiator back into place, yet haven't had a chance to grab pictures or put together a detailed writeup yet. However, did grab 2 pictures when I was mounting the new fans to the radiator. Here is a picture of the radiator and then a second with the new fans mounted. 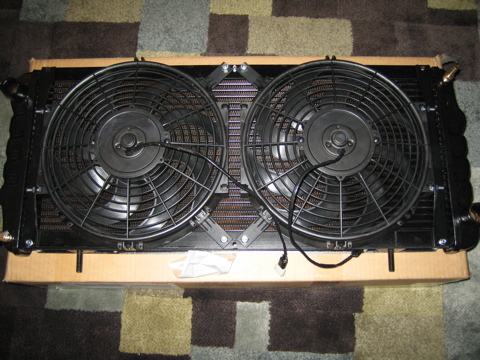 The fans seem very nice with the exception of black electrical tape around all the wires. Wish it was a sealed wire as I have a feeling the electrical tape will start to deteriorate. 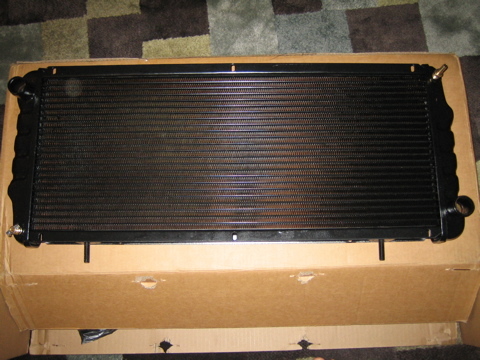 Well I have had these low power fans from Toby @ DeLorean Parts Northwest since February and just never had the time or spare cash to pick up a new radiator. 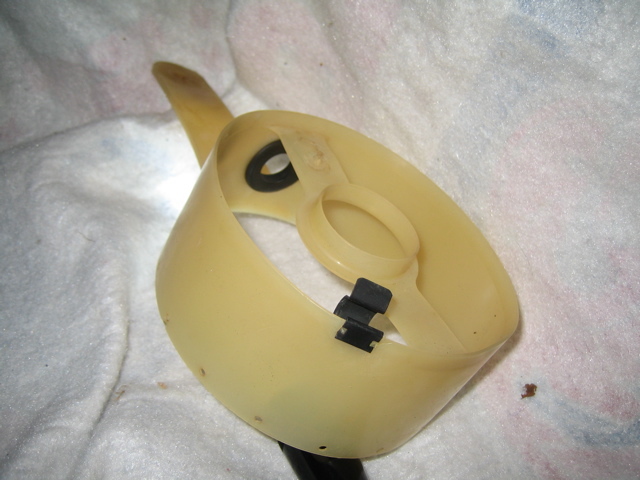 Then, toward the end of June I had an otterstat failure, and then the middle of July the otterstat started to leak (the car was not driven once the otterstat failed in June). I figured that since I had to drain the system anyway to get the otterstat fixed, now is as good of time as any to do the rest of the coolant system. So, picked up the 3-core brass radiator from John @ Special T Auto as well as some other parts such as the new otterstat, some hose clamps, fused fan fail, etc. 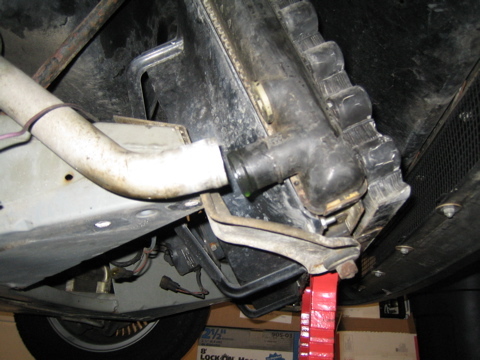 Ended up grabbing a NOS coolant pipe bracket from Rob @ PJ Grady to replace a crappy one in the engine bay. And finally some coolant hose from McMaster Carr. The plan is to replace the radiator with the new 3-core, install the new coolant fans, replace the broken otterstat, replace the remainder of the coolant hoses under the car (as the engine bay was done during the valley of death teardown), replace the fan fail device with a regular fused unit, install a bleeder by the radiator (if the new 3-core doesn't have one), do some rust touchup on the front frame extension, and repaint the A/C condenser. 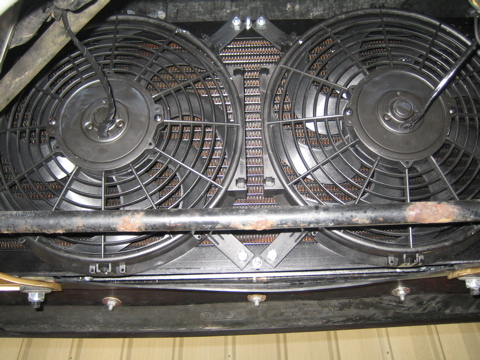 As for the electrical work, I am planning on getting rid of the fan fail device as mentioned above and using a fused jumper (sold by Special T Auto) but putting lower rated fuses due to the lower powered fans. I may also drop the circuit breaker down a bit. In addition, I plan on cutting into the wire that turns on the fans when the A/C compressor runs and instead attach it to the mode switch, so the fans will be on continually when the A/C is running. I dislike how they kick on and off with the compressor. Finally, I am going to replace the red LED light behind the "Cooling" text on the center console with a blue LED. The "Cooling Fan Fail" light already came on when the fans were on, so I had covered up from behind the "Fan Fail" text. It will continue to do so now and I like it like that, just would like the light to be blue instead of red. 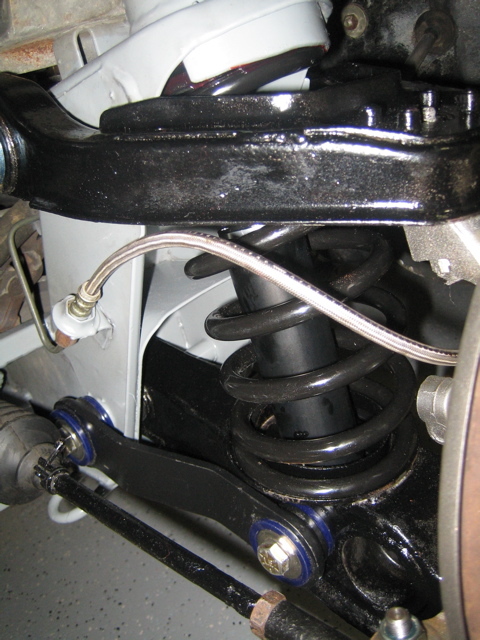 So far I have removed the sway bar, shroud around the radiator, horns, hoses up by the radiator, drained the system, unbolted most of the radiator (lower brackets are loose) and removed the fuel closing plate. Next up is replacing all the hoses, otterstat, and then waiting for help with the radiator dropping and replacement. Had some problems lately with the outer toll booth window seals leaking. As I am in the process of redoing them, I found a bolt to my drivers window track extremely loose. I tightened it up and put the window up, sure enough it hopped off the track. 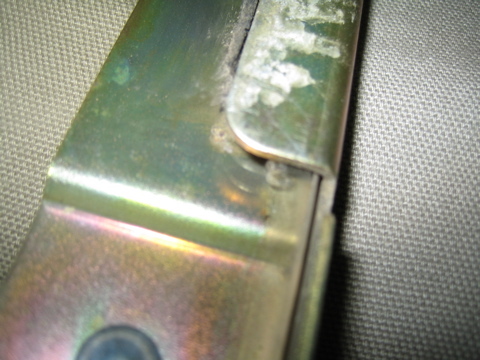 Did some reading on the DML and didn't turn up much except one mention of the bracket sliding. Decided to pull the window to investigate further. Pulling the window isn't that difficult, you need to remove the upper door panel and the black bracket that pushes against the window and has the felt strip. This allows the window when pushed up to slide inside the car rather than into its channel. Put the window halfway down, unbolt the window motor piece from the window (its the tubular center area with two nuts holding it in). Wiggle the bracket out, and now the window is free. Pull it up and keep working the window until you get it out. 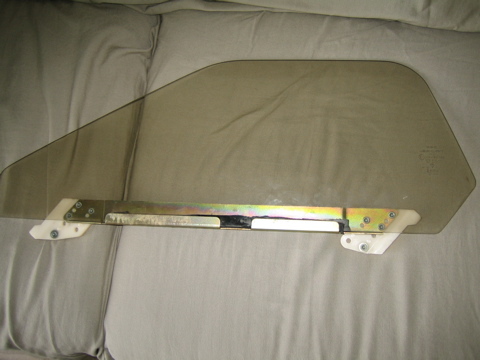 Now the window is attached to the metal bracket which has the sliders on it that fit into the track by a slightly adhesive rubber substance. I believe that its purpose is meant more as a pressurized attachment than it is an adhesive attachment. I looked and sure enough, there are dimples in the glass that alert you to where the track should be, and mine was about 1/4" to 3/8" pushed back. This means that when the window is going up, the front hits the channel first and then the motor has to push harder to get the window to 'slide' backwards into place. This force pops the front of the window off the track. My previous owner must have had this happen and as a fix loosened the track so it flexed backwards also. Here are some pics of the window out, as well as a closeup where you can see the round dimple in the window. There is one at the front and the back when the metal bracket is lined up properly. 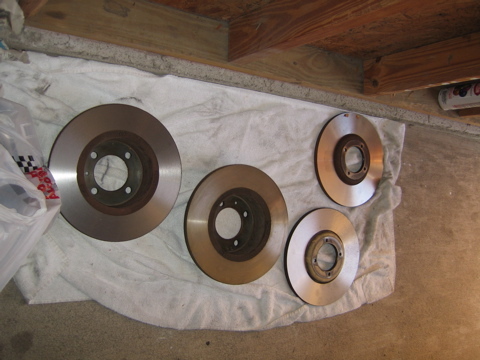 Only a bit of a problem getting the rotors shaved down. The first place I went to was being operated by a moron who couldn't figure out how to measure the thickness of the rotor. Second place had no issue. So getting those shaved down saved a few bucks. 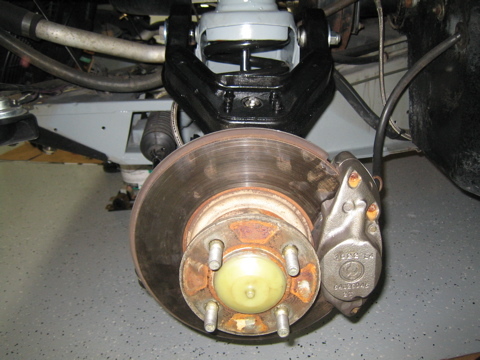 Got all the new parts in, rebuilt calipers from Special T Auto with anti-squeal shims, anti-rattle shims, and some nice organic brake pads. 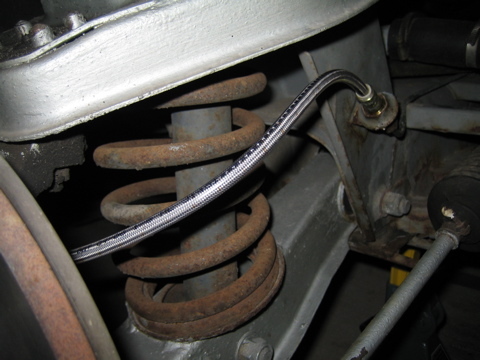 Picked up the stainless steel brake lines to cut down on brake fade, and picked up DMCH's remanufactured, correctly proportioned master cylinder. 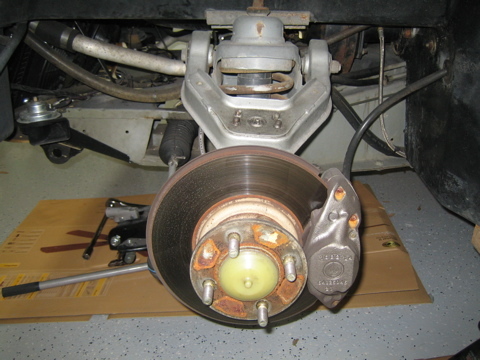 While I was finishing taking apart the rest of the brake components, it looked like I may have just been starting to get a master cylinder leak, so I am glad everything is getting replaced. 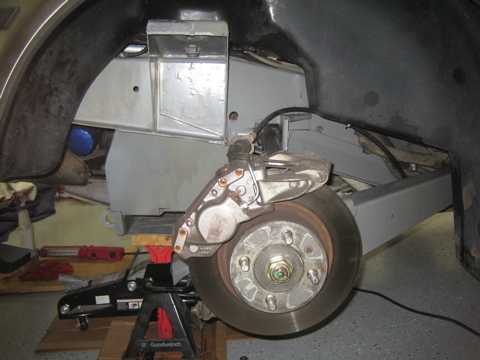 My main concern was getting the wheel bearings pressed out of the hubs and new ones pressed in (yeah, I got new bearings from Special T Auto also). But, found a nice small machine shop not too far away that took care of it for $40 total. Came out real nice.